Academy OpeningsA list of grand openings when they occur, keep checking the RSS or link to the page to see the latest in jiu-jitsu academy openings. This article provided by our guest writer Tyy Withrow. Tyy runs his own blog called BJJ Paperweight. We look forward to working with Tyy more, be sure to keep your eyes out for some more articles by him! Welcome aboard Tyy!!! It’s been a couple of crazy weeks for me and I’m finally able to sit down and talk about a seminar I was able to help out with. The “Give the Gift of a Gi – BJJ Seminars for Kids” kick-off seminar was a huge success. It was held on October 26th at Foster Brazilian Jiu Jitsu in Kent, Washington. Quite a few Black Belts shared their expertise; Kris Shaw, Cindy Hales, Michelle Wagner, James Foster, and Jean Freitas. There were three different seminars for three different age groups. With this grouping model each seminar ended up being the perfect size. In total there were about 55-60 kids, which is a great turn out. Of those kids, I would guess about 10 had never tried Jiu-Jitsu including my two little nephews. The seminar they attended was their first day of Jiu-Jitsu. I credit the quality of the seminar with the fact that they both enrolled to train the next week. Yes, I’m a proud uncle. Several aspects of the BJJ Seminars for Kids made it a special and important event to attend. The importance of this seminar is that all the proceeds went to Jammin’BJJ, a branch of the non-profit Carly Stowell Foundation that helps kids have access to sport and music education. 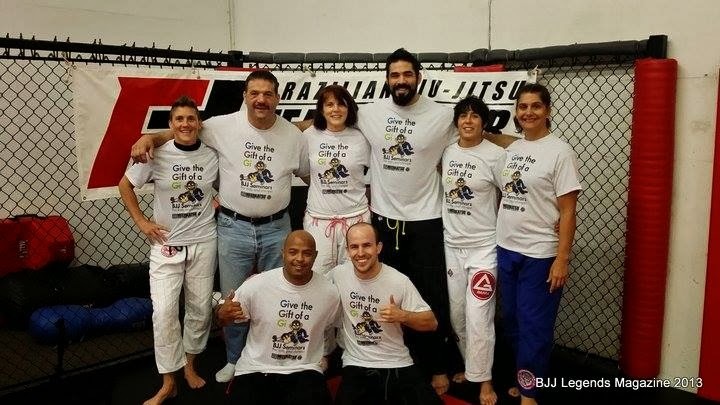 Jammin’BJJ is a great organization that helps kids down in the favelas of Rio de Janeiro, Brazil participate in BJJ. In Rio it is not unusual for kids to be picked up by the drug trade or gangs. Jiu-Jitsu helps them stay off the street and gives them a healthy community to belong to. 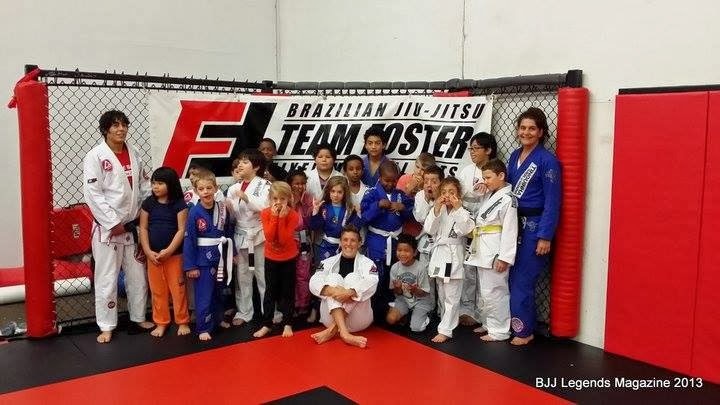 Jammin’BJJ helps support kids a variety of ways. Through “Give the Gift of a Gi” many children received a gi to train in. Support also takes the form of paying for monthly dues, and paying for tournament registration. They have helped a ton of kids down in Brazil, and they just recently helped some kids here in the US. With the support of Jammin’BJJ, two children who otherwise would not have been able to, were able to compete in a local tournament; both kids medaled! The success of the BJJ Seminars for Kids event helped to make this assistance possible to provide. Jammin’BJJ’s primary focus is to collect used kimonos and bring them down to Brazil. For most of us having more than one gi is common. When I talked with Elena, she said that a lot of times children will need to share a gi. 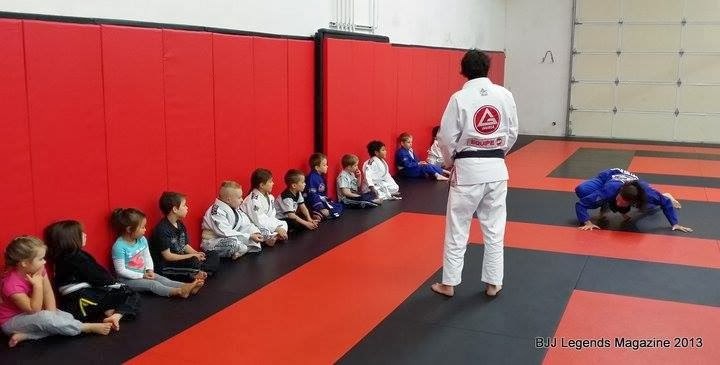 Some kids stop training when they get older because they are embarrassed to not have a gi. With the foundation’s help, a gi can be provided to the kids in need as well as the adults. Elena pointed out that many of the coaches in the favelas reach into their own shallow pockets to help the kids and wear gis that are very tattered and old. It’s awesome to see the work that they are doing and to hear how small gestures change lives of these kids. If there is any way you can help I urge you to do so. If you want more info the site is here! Back to the review! So the series of seminars started early in the morning – well early for me. We started with the 17 of the smallest kids (ages 4-6). The kids had a blast. This group was led by Professors Cindy and Kris who did an amazing job. Many of the games they played are the ones I know we use in our kids’ classes to help form the basis for Jiu-Jitsu. You would have never been able to tell, but Cindy and Kris had never worked together before. I was very impressed with way Cindy and Kris’ teaching styles blended and played off of one another. I was able to help out a little in this class which was awesome for me because my nephews were in this class. This class was an hour long and the kids all paid attention and kept active. I loved that they were engaged the whole time. Professor Jean came in half way through the class with a Darth Vader mask on and joined in on the games. The kids loved that and it added a ton of fun for us as well as the kids. The second class started right at 10am and went until noon. This one was for 7-11 year olds, and had 22 kids or so in it. This class was a blast because they did more drills – well okay, they were games, but game-like drills that focused on different types of control. This class was led by Cindy, Jean, Kris, and Michelle. Jean still had the Vader mask on for part of it while we “drilled” haha. After the drills the kids were shown different type of moves to practice. They all drilled those moves without complaint. I never once heard “I can’t do this, I’m tired, or this is too hard”. Honestly, I was surprised. Two hours of Jiu-Jitsu is taxing for most adults, but these kids loved it and wanted to keep going. We had a good break in between classes for lunch and a recharge, thankfully. Working with the kids really took a ton of energy out of us! The last part of the seminar was for ages 12 and up. This was a 3 hour seminar! For as long as the day had been, we remained excited. This seminar was headed by Coach Foster, Jean, Kris, and Michelle. 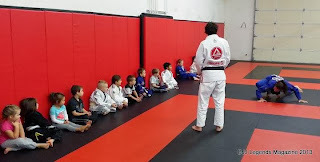 The group had more veteran Jiu-Jitsu kids, so the class felt more like an adult seminar. The kids learned quite a lot of Jiu-Jitsu. Each instructor showed a move or two that the kids would drill. Each instructor kept the kids engaged in their own way. It was invigorating to see the kids love every move and take everything in. The kids got to roll with the instructors as well as the other participants. By the end of the seminar all the adults were worn out, but luckily so were the kids. The kids were very thankful and happy to learn from such knowledgeable black belts. Throughout the entire seminar the kids were provided snacks and juice which was a really nice touch. They only got them if they were good though! Which of course all the kids were. During the ages 12 and up class, Coach Foster talked to the kids about why this seminar was put on and who they were helping out by being there. I think it is important for all kids to understand that most of us have it good and that they are helping out other kids and people in the world whose lives are far more difficult. Overall, I couldn’t have imagined the seminar being better. The parents were happy, the kids were happy, and it was a day full of Jiu Jitsu. What more do you need? 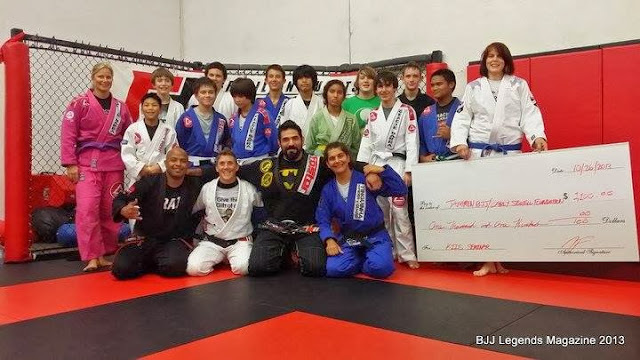 With the donations from the seminar Jammin’BJJ was able to raise $1100!!! I know Elena was blown away with the results, and I’m very happy that our Jiu-Jitsu community was able to come together and help out. I think Jammin’BJJ and Give the Gift of a Gi are brainstorming ways to put on these seminars in other gyms. I hope so. Contact Elena if you are a coach interested in hosting a seminar. 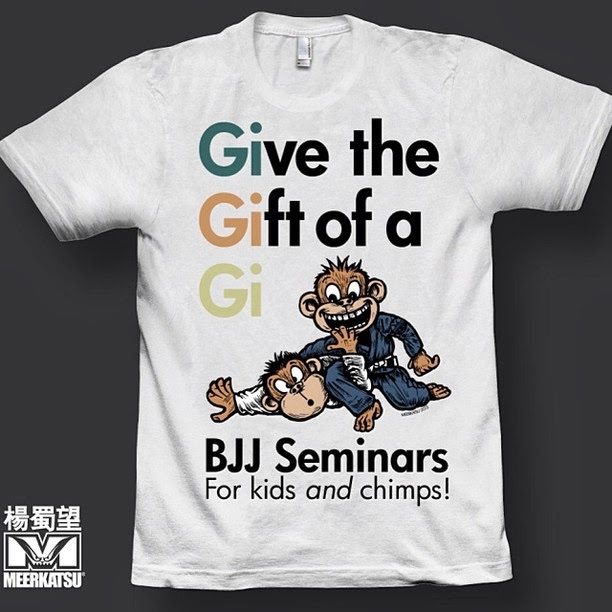 There are also some really cool shirts available supporting the BJJ Seminars for Kids – Meerkatsu did the artwork! Check them out and buy one on the Jammin’BJJ website.